Most associations and show managers are pleased when the exhibit hall is sold out. However, for the SHOT Show, owned by the National Shooting Sports Foundation and produced by ConvExx, this presented a challenge. With an exhibitor turn-over rate of less than 5%, well below the industry standard rate of 30%, there were less than 100 new companies exhibiting annually. As it is a well-known fact that the number one reason for attending trade shows is to find new products and resources, it became important to satisfy this requirement and ensure the show continued to be relevant and a go-to event each and every year. 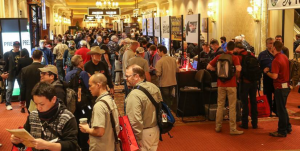 There was concern that buyers would look to other means for sourcing, and begin to attend the SHOT Show less frequently. 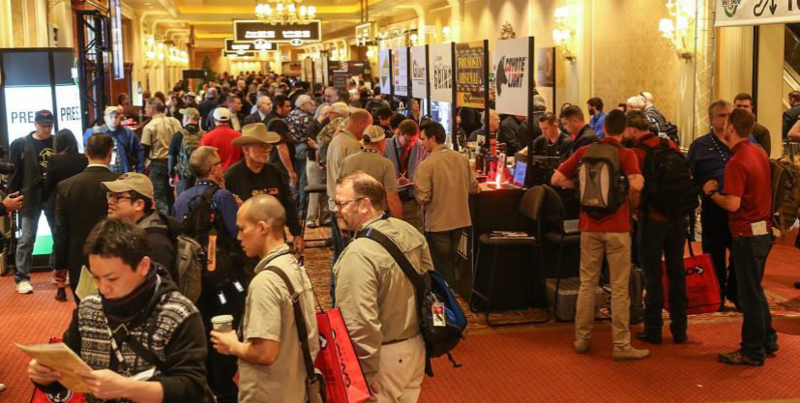 And with a wait list of over 2,000 companies wanting to exhibit at the SHOT Show, it was important to expose buyers to new sources, technology, and product lines. While recognizing the show floor was completely full and the show could only expand if it became creative within its existing footprint, ConvExx developed a plan to create 100 kiosks on the third floor foyer of the Venetian meeting room complex, a quick escalator ride from the foyer of the second level Sands exhibit hall. This area was traditionally used as an entrance to the Press Room and Members Lounge, as well as a handful of small booths for the non-profit industry friends that were provided complimentary space. Essentially…it was an area of the building that has never generated revenue and simply a thoroughfare. Working closely with Freeman Company and the Sands/Venetian, ConvExx created a floor plan that could be approved by the fire marshal, and allowed access to the existing association activities on that floor. Because this was going to be the first time exhibiting at any trade show for many of the companies, ConvExx created a turn-key package that included a kiosk with custom branded signage for each company, electrical and lead retrieval access. This new pavilion would need to be branded completely different from the rest of the show so people knew it was a new and key attraction of the SHOT Show. It was named “NEXT” to simply convey that these exhibitors were the NEXT GENERATION of exhibitors to the SHOT Show. Now attendees can find 100 new companies all in one place in an easy-to-navigate pavilion. Ensuring that buyers made it to the 3rd floor demanded a special marketing plan as it was traditionally looked at as simply a hallway off the Press Room and Members Lounge that lead from the Venetian Congress Center to the Grand Canal Shoppes. The plan included pre-show emails, press releases and a special website, as well as on-site signage, mobile app messaging and old-fashioned ribbons and buttons advertising the NEXT Pavilion. A special logo identified NEXT exhibitors on the mobile app and in the directory. What resulted was a huge success in which a new generation of exhibitors that had previously been on the waitlist for years, showcased their products to the industry. The area was packed with buyers and media from the moment it opened until the Show closed. A great majority of the 2016 NEXT exhibitors have now been placed on the traditional show floor, now well-equipped and schooled on how to exhibit, and a new group of wait listed exhibitors will be invited to participate in the 2017 NEXT Pavilion.